A city just begging to be explored, sightseeing and shopping, monuments, museums and art galleries, bars and restaurants or a simple stroll along the seafront promenade. 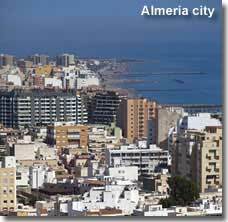 An historical city with a modern feel, Almeria City has something for everyone and makes an ideal day trip destination though one visit will undoubtedly be the first of many. The main city attractions, and must do places to visit, are the old quarter of the city, the ancient Alcazaba fortress and the City Cathedral. 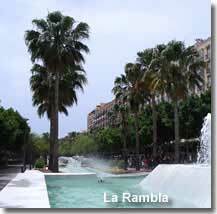 In the centre of the city is La Rambla, Avenide de Frederico Garcia Lorca, a long tree lined avenue that leads down to the port and beaches, it has a vibrant and modern feel with bustling street cafes, tempting shops, feature water fountains, and play areas for children. With easy access from the motorway there is plenty of underground parking. Close by is Paseo de Almeria, the main road for serious shoppers, with its neighbouring streets packed with appealing little boutiques. 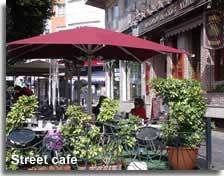 Avenida del Mediterraneo, runs right through the city centre and is home to the Mediterraneo shopping complex. Hotels are readily signposted, as are the convenient train and bus stations. Not without its traditional bullring, the Plaza de Toros de Almeria dates back to 1888 and has a capacity for over 9,000 spectators. A huge iron railway bridge, Cables Ingles, constructed by a British mining company in the early 20th century, dominates the landscape at one end of the port, part of the industrial heritage of the city, from the mining era of Almeria, it is now being restored to be promoted as a tourist attraction. The ferry terminal by the port offers trips across the Mediterranean sea to North Africa, and the Parque de Nicolas Salmeron, a narrow strip of approximately one kilometre in length, situated between the port and the city streets, provides green areas and shaded seating. The Barrio de la Chanca, the cave quarter, is part of the old town, and has been depicted in many artistic impressions. There are still some families living in the colourful cave like dwellings which are part built into the rocks of the hillside on which the Alcazaba stands. The tourist train, which runs at the weekend, takes a route through the old quarter and port area, offering a relaxing way to see the city sights. The starting point for the train is at Plaza de Emilio Perez and the timetable is available from the Almeria Turismo website. Located in the heart of the Old Quarter, on the site of a former Arabic souk, the Aire de Almeria has recovered an ancient Arabic baths and restored an ancient tradition. A testimony to the Muslim presence that enriched the cultural and social heritage of Almeria city, here, in luxurious surroundings it is possible to indulge ones self in the custom of Arabic bathing, incorporating the ritual of moderate, warm and cold immersions to cleanse the mind and body. A trip to the city would not be complete without experiencing its nightlife and local cuisine. The restaurants and bars in the centre of town are located between Paseo de Almeria and La Rambla and the area is noted for it excellent seafood and tapas. 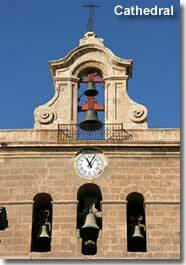 Almeria City commemorates many fiestas, having religious or historical connotations they are celebrated round the clock with passion and enthusiasm, such momentous local occasions where everyone is made welcome. The Almeria Turismo website provides details and dates of the Almeria city fiestas. 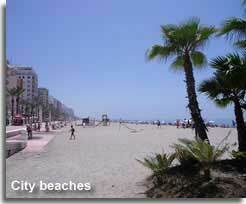 The beaches of Almeria city, located east of the port area, are deserving of and detailed in a separate page. While the fabulous city beaches are obviously the most convenient there are some lovely rural beaches away from the city bustle that are within easy reach. Tourist Information: The tourist information centres and their opening hours are available from the Almeria Turismo website. Bus station: The bus station provides links to destinations within and outside of the province of Almeria, bus routes and destinations are available, in English, from the ALSA bus company. Train station: The train station provides links to destinations within and outside of the province of Almeria, train routes and destinations are available, in English, from the RENFRE national train company. Holding a commanding position above the city centre, the Alcazaba castle is a must see monument and highly recommended historical attraction. The word Alcazaba comes from the Arabic word for citadel, it describes a Moorish city and walled fortification. Offering shelter in times of battle, and not without its majestic palaces, it was designed to support and maintain the trade and livelihood of the population within the perimeter walls. 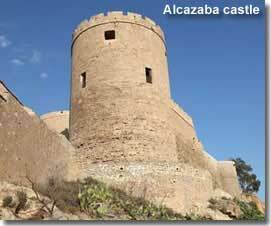 The Alcazaba of Almeria is strategically positioned on a hill, towering over the city and looking out towards the port and the Mediterranean sea. 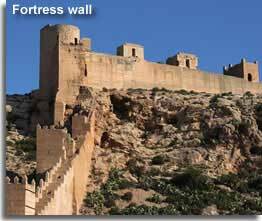 This colossal fortress, divided into three sections, is the second largest Moorish stronghold in Spain after the Alhambra in Granada. Its origins and turbulent history reflect of the unsettled ages of the city. 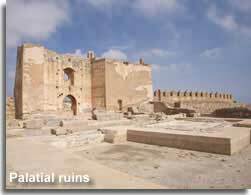 It was built in the 10th century under the reign of Abd-ar-Rahman, the most powerful prince of Iberia, in order to defend the prosperous city against enemy attack. These were ancient Moorish times when the Arabs were the rulers of Southern Spain. In the centuries that followed, Almeria city experienced many sieges, though it wasn't until the late 15th century that the city surrendered to the Catholic Monarchs, Ferdinand and Isabella, falling permanently into Christian hands. In the 16th century the city was subject to numerous earthquakes, of which the one in 1522 was particularly devastating and much of the city and parts of the Alcazaba were destroyed. 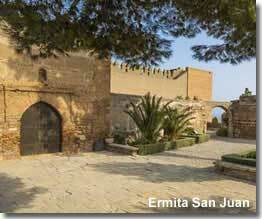 In recent years the Alcazaba has undergone a considerable amount of restoration. Of the three different fortified areas of the Alcazaba, the first section, encountered on arrival through the main entrance, is now principally a pretty garden area which incorporates the walk of the north wall and includes the ancient remains of the Arabic aljibes, the storage tanks that provided water for the citadel. The garden area is truly beautiful, enhanced by the fortified historical surroundings, a world away from the hustle and bustle of the city streets below. The gardens lead to the wall of the watchtowers, its centrally positioned bell was added to the fortress to war n the population of the impending pirate raids that were regular occurrences between the 16th and 18th centuries. This connecting wall separates the first and second sections of the monument and also links the north and south watchtowers. Entry to either watchtower can be achieved from the second enclosure. From both towers the panoramas are far reaching, the north tower offers views to the Cerro de San Cristobal, St. Christophers hill, and of the extended fortress walls that were built in the 11th century to enlarge the city defences. Access to the second enclosure a nd central section of the Alcazaba is gained by way of the wall of the watchtowers, via a characteristic Moorish room and archway leading onto a beautiful garden area with a pond and fountain. 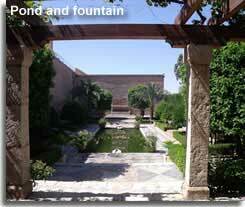 This section was home to the royal palaces, bath houses and mosque of the Alcazaba. After the Christain conquest the mosque was replaced by the Ermita de San Juan chapel, it was built by the Mudejar on order of the Catholic Kings. The Mudejar was the name given to individual Muslims that remained in the territory and submitted to the rule of the Christian Kings, it also denotes the style of Iberian architecture strongly influenced by Moorish workmanship which is still evident today throughout the entire city. The chapel is now utilised as a multi use exhibition room. Centrally situated within the grounds, the Casas Arabes exposition, a reconstructed Arabic building, houses a display of ancient artefacts, dated from 10th century and onwards, and has a small room playing an informational video, in Spanish. The palatial areas are mostly ruins, however placards are in place besides the palace foundations, they offer depictions of what the palace areas would have looked like and make the excavated remains easily identifiable. The third part of the Alcazaba is the Christian castle, constructed after the conquest on instruction from the new sovereignty. 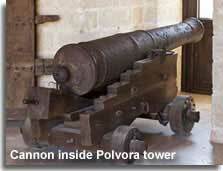 The castle comprises of a courtyard and three towers, one of which, the tower La Polvora, the tower of gunpowder, has the defence cannons readily positioned for battle. 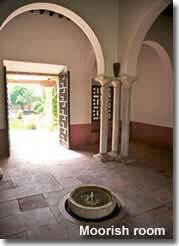 There is a small shop and information point on entry to the Alcazaba, and there are public toilets and drinking fountains throughout the site. In the second enclosure there is a small coffee room with a drinks machine and snack machine. There is parking available to the side of the Alcazaba, or alternatively park in one of the town centre car parks and walk to the entrance. A really worthwhile place to visit, this itinerary would easily pass the best part of half a day, and could be combined with a visit to the Cathedral, just a five minute walk away. The pretty Cathedral plaza has a couple of cafes with plenty of outside seating, ideal for a little refreshment after walking around the Alcazaba. ENTRY: Entry is free to EU citizens. OPENING TIMES and further information: available from the Almeria Turismo website. make the most of the area, will open in a separate page. Almeria Cathedral, much like the Alcazaba, symbolises the ages of conflict forced upon the population of the city. Building commenced in 1524, not very many years after the city had settled under the reign of the new Catholic Monarchs, in the site of the previous building that was ruined by the 1522 earthquake. It is unique in its appearance, its castle like towers held cannons and armoury, and its resemblance to a fortress had good reason. PIRATES. Pirates and privateers operating from the North African capital ports of Morocco, Algeria, Tunisia and Libya, an area that became known in Europe as the Barbary coast, were initially attracted to the area because of the cargo of the merchant ships. However in the 16th century and onwards, in addition to seizing ships they would raid the city for another purpose, to capture Christian slaves to be sold into the Islamic market in North Africa and the Middle East, attacks which increased in frequency when these territories came under the sovereignty of the Ottoman Empire. 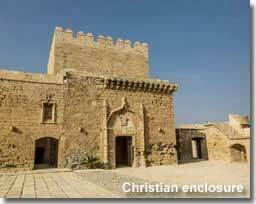 The Cathedral was not only a religious sanctuary, due to its close proximity to the port area, it also functioned as a defence fortification, protecting the people of the city in the times of these horrendous invasions. Nowadays we can only reflect on the history and suffering of these people and in their remembrance enjoy the beauty of the Cathedrals architecture. 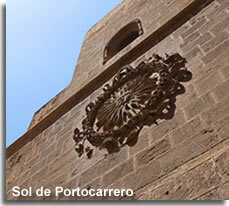 A 16th century carved sun, the Sol de Portocarrero, is found on the eastern side of the building, it is now an emblem of the City of Almeria. 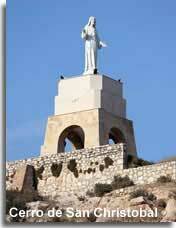 provided to help visitors make the most of the area, will open in a separate page. 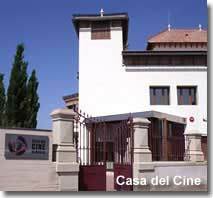 The Cinema Museum of Almeria, which recently open in January 2011, offers an insight into the cinematic legacy of Almeria. 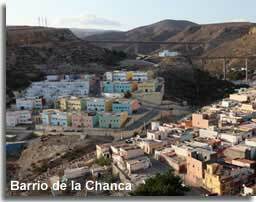 During the mid to late 20th century Almeria grew into an esteemed location in the movie world, the natural landscapes and sunny climate captivating the discerning eye of many a film producer, and, besides the city itself, the Tabernas Desert and Cabo de Gata panoramas became the backdrops to hundreds of movie scenes. From the world renowned directors of Sergio Leone and Steven Spielberg to the actor megastars of Clint Eastwood, Harrison Ford, Raquel Welch and Alec Guinness, Almerias film history is quite astounding. 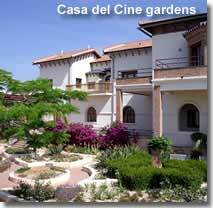 Casa del Cine is located within a grand home known locally as Casa de la Torre, Santa Isabel or Casa Balmas, more than a century old the ancient cortijo was acquired by Almeria Town Hall in 1991 and restored to the admirable building that it is today. The building now pays homage to the cinema history of Almeria using scenographic exhibitions and displays with impressive special effects. 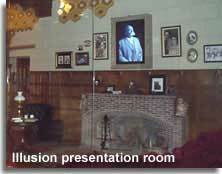 Particular interest is shown to its past occupants, having been visited by influential movie directors such as David Lean, several famous actors, such as Peter O'Toole and Yul Brynner... and including none other than pop music legend John Lennon, who resided in the house for a short period during the filming of the satire How I Won the War directed by Richard Lester. While in Almeria the Beatles star is said to have written the song Strawberry Fields Forever which was included in the album Magical Mystery Tour. Its rooms hold many historical memories, as a tribute to Lennon, the 'Source of Inspiration' room of Casa del Cine recreates the bedroom used by this talented musician, with furniture, objects, images and sounds producing a magical and sensorial atmosphere. The museum can only be experienced by guided tours which must be pre booked in advanced, there are ten rooms to be visited including the 'Lights, Camera, Action!' room - a gallery where the settings of the most important films shot in Almeria have been recreated by the chroma key compositing technique, allowing the visitor to see him or herself projected inside the movie scene. The guided tour, including a video presentation, is currently only delivered in Spanish, however the video is available in English and should a group booking be made it is possible to arrange for the video to be presented in English. Unbelievably the price of this tour is just 3€ per person, (price established in June 2012), with discounts available for under 18s and pensioners. Address: Calle Camino Romero, 2. The Archaeological Museum of Almeria, includes exhibits from the important Los Millares site of Santa Fe de Mondujar. 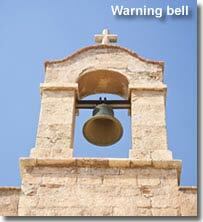 Address and opening times: available from the Almeria Turismo website. The Civil War Museum, including the significant war tunnels. 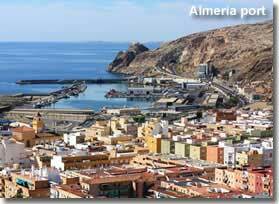 Address, opening times and further information: available from the Almeria Turismo website. Centro de Arte Museo Almeria (CAMA): Centre of contemporary art. Centro Andaluz de la Fotografia (CAF): Focuses on all aspects of photography at a local and international levels.